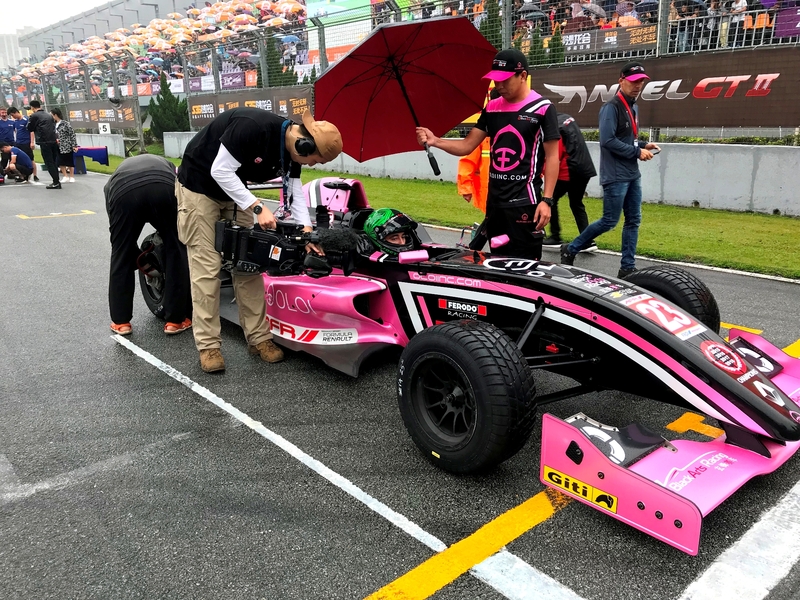 This weekend, four-time Asia Formula Renault Championship-winning team BlackArts Racing got off to a stellar start for the season, at the famous Pan Delta Racing Festival at Zhuhai International Circuit. BAR featured an international driver line-up with three entries in the pro class: Joey Alders [Netherlands], Sandro Tavartkiladze [Republic of Georgia], and Stephen Hong [China], with the car of Alders in OLOI-BAR livery to proudly display OLOI, Inc. as the primary sponsor of BAR for the 2019 race season [www.OLOIinc.com]. Alders took the fastest time in both Official Practices on Friday, with Sandro and Stephen Hong alternating in the top five. Saturday morning’s qualifying had challenging conditions, starting with rain but progressing into dry with no less than five red flags during the session. Despite this, Alders dominated pole position by almost a second in the OLOI-BAR car, with fellow AFR newcomer Sandro Tavartkiladze taking 6th and Stephen Hong 10th. Race One followed at 1:20pm under rain conditions. Alders took second place in the race but received a jump start penalty which placed him in 8th; which moved Sandro Tavartkiladze from his 5th place finish to 4th in his first AFR event, with Stephen Hong taking 6th. Race Two was held at 4pm Sunday afternoon in overcast conditions. In a drama-filled race, Joey Alders started once again on pole position and got off to a fantastic start, leading the race flag to flag to take the win in the OLOI Powered by BAR car. However, Alders was penalized for a jump start, which moved teammate Sandro Tavartkiladze from his second place finish to take the race win for BlackArt Racing, in the process becoming the first driver from the Republic of Georgia to win a race in China, and becoming the new points leader of the 2019 Asia Formula Renault Championship. Meanwhile, Stephen Hong had a brilliant start and was rapidly moving up to the front of the field until being hit by a competitor, causing both him and the other car to DNF. Joey said: "I really like to race in Zhuhai. The car felt really great and the pace was good. I feel so bad for the team because I was penalized twice, especially after I managed to set a new track record for race pace and finished 32 seconds ahead of 2nd place, in Race Two. Next time I will be stronger." Sandro said: "It was a fantastic first race weekend with different conditions and challenges. The wet conditions made qualifying harder because I have never raced in the wet with proper tires, but it was an amazing experience at least and not so bad for the first time. The second race was very good with awesome battles. Joey was fastest but unlucky, so I managed 1st place which makes me very happy. I want to thank all the team for the help and advice they gave me. The car was fantastic." Stephen said:"This weekend is really important and it is a big step for me, I really want to perform well, even though I lost focus in the qualifying session, lost the opportunity and got penalized. But the following 2 days, I used all my ability and freed myself to realize my real potential, I pushed hard and passed a lot of cars. Even though in the 2nd race I was knocked out the race by damage caused by contact with a competitor, I really felt like I showed my true abiity. The fighting in race 2 was fierce, my car was strong, and I was on my way to one of my best finishes ever. I am confident, next round I will show even better results." 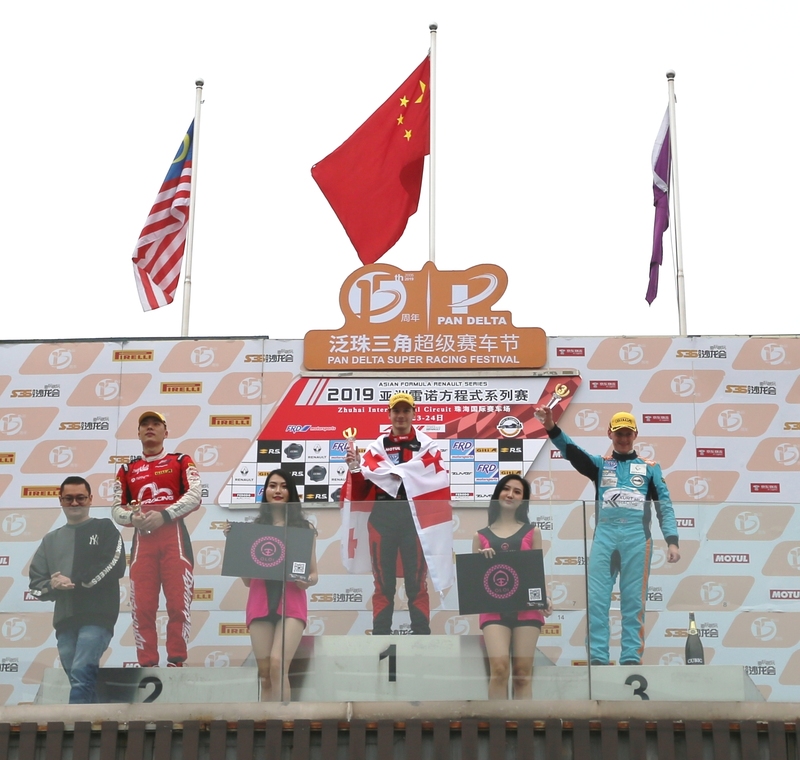 The six-round, 12 race Asia Formula Renault championship will next visit the Ningbo International Speedway near Shanghai for Round 2, May 25th-26th, before returning to Zhuhai. From there, the series will head to the new Tianjin Circuit near Beijing before concluding overseas with two rounds at the famous Sepang International Circuit. OLOI is a San Francisco-based motorsports-inspired line of apparel which focuses on blending performance with time-proven classics in its product line. Please support the OLOI brand by subscribing to their website for more details, and also to support their exciting Kickstarter campaign. For more information on OLOI, please visit: http://www.OLOIinc.com. BlackArts Racing Team is a China / Hong Kong registered motor racing team that was formed in January, 2015. Its main operational headquarters is located within the Zhuhai International Circuit, in Zhuhai, Guangdong Province [bordering Macau]. The team’s business operations predominantly focus on professional racing series in Asia including F3 Asian Championship, Asian Formula Renault Series/AFR Series and various touring car series. The team also provides year-round beginning and advanced driver training via racing schools, individual driver training, and corporate track days. For more information on BlackArts Racing please visit http://www.BlackArtsRacing.com.